To find an answer, we took a deep dive into Baby Boomers’ housing decisions. Here’s what we found. Boomers are still working (and parenting). Boomers’ households function a little differently in another way, too. The children of Boomers have delayed moving out of their parents’ homes. In 2016, 16.1 percent of senior households had younger generations living with them, compared to 14.4 percent in 2005. As retirement and the kids moving out are often triggers for downsizing, it’s no wonder Boomers are sticking with their old digs—many still need them. Housing inventory is tight. But don’t blame boomers. Many places across the U.S. are short on housing inventory, and affordability isn’t going in the right direction either. It might be easy to look at Baby Boomers hanging on to their homes and point the finger at them. After all, if they’re not moving into smaller homes, the cause of the bottleneck seems obvious. 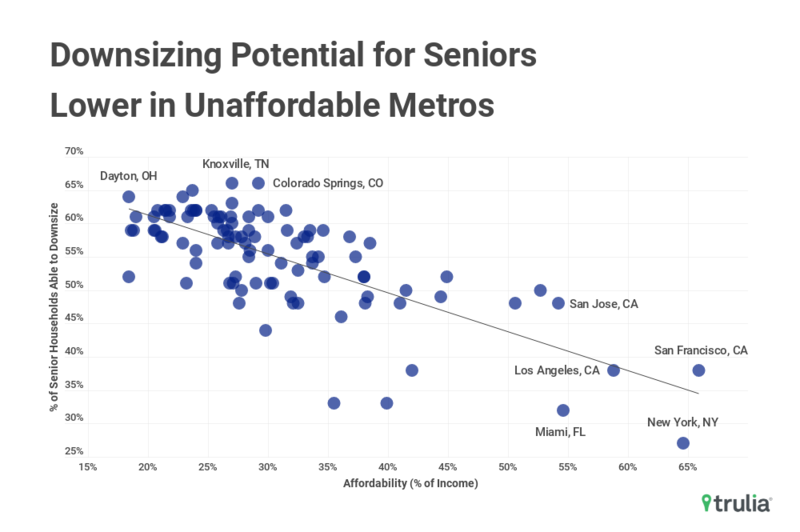 But we found that in places where housing inventory is most needed—which are also the most unaffordable metros in the nation—seniors are renting, just like the rest of us. 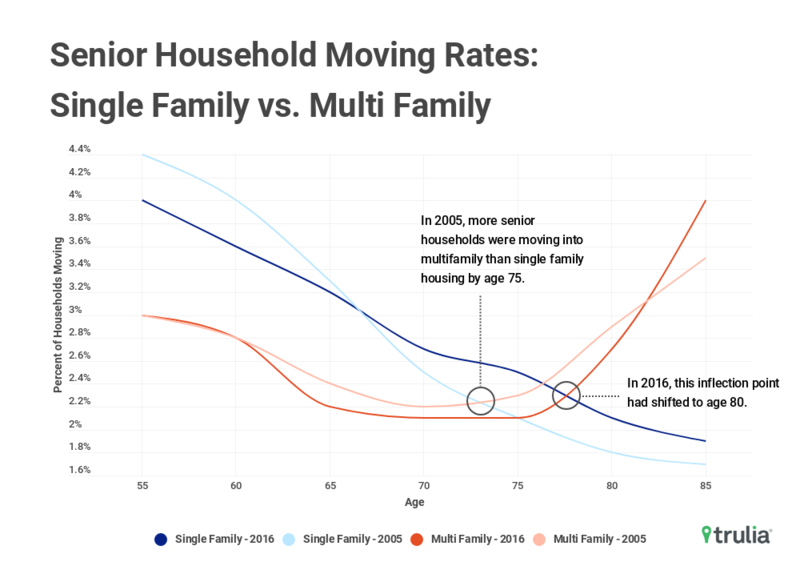 But about all of those empty rooms in the metros where Boomers are staying put: There is a noticeable shortage in housing that would be appealing to growing families. This is also true in more affordable metros like Knoxville, Tennessee, where inventory decreased 12.4 percent year-over-year during the second quarter of 2018—even though Knoxville has a high percentage of seniors who are in a position to downsize (66.4 percent). Boomer movement could bring housing market relief. Now, the good news. The prolonged Boomer stasis could mean their eventual migration into smaller homes is inevitable and incoming. “While some observers think Baby Boomers are contributing to the inventory crunch by staying in place, others believe Boomers are holding on to their homes to time the market and that a massive sell-off is on the horizon,” says Alexandra Lee, housing data analyst for Trulia’s Housing Economics Research Team.